A few days ago, the New York Knicks officially launched an innovative social media oriented site that has become a hot topic of conversation in the digital sports space. 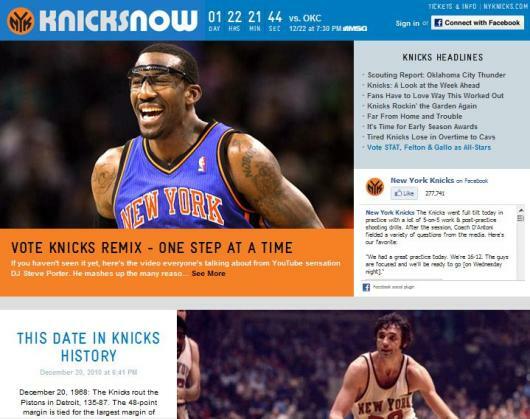 The site, KnicksNow.com, is a team-operated community that provides real-time social media insights and nuggets of information in a concise, digestible format. KnicksNow.com offers a tremendous amount of high-quality content in a simple format - two aspects of digital media that fans are looking for. The site features a plethora of videos, high-res images, post-game interviews, blog posts, relevant tweets, live Facebook integration, content sharing features, headlines, quotes, daily photo uploads, and caption contests. Fans can feature @thenyknicks in their Tweets throughout Knicks games for the chance to be featured on KnicksNow.com. Per Howard Jacobs, EVP of Marketing and Sales for MSG Sports, "KnicksNow.com is the next digital step in our total fan engagement strategy. It's the ultimate destination for our most passionate and loyal fans to access exclusive, behind-the-scenes content on the team and fully engage with other Knicks fans and our players in the dynamic, ever-changing conversation that's taking place across the social media landscape."